Thanks to Swiffer for sponsoring this post. As always, opinions belong to us! Don’t Be That Smelly House Pet Family! Follow These Easy Tips To Keep Your House From Smelling Like A Dog! Did you know that 59% of pet owners feel that their “pets make their house feel like a home” YET 70% of American parents (and 75% of pet-less parents) say that concerns over pet messes can prevent them from adopting pets? We think it’s simple … Don’t Sweat Your Pet! 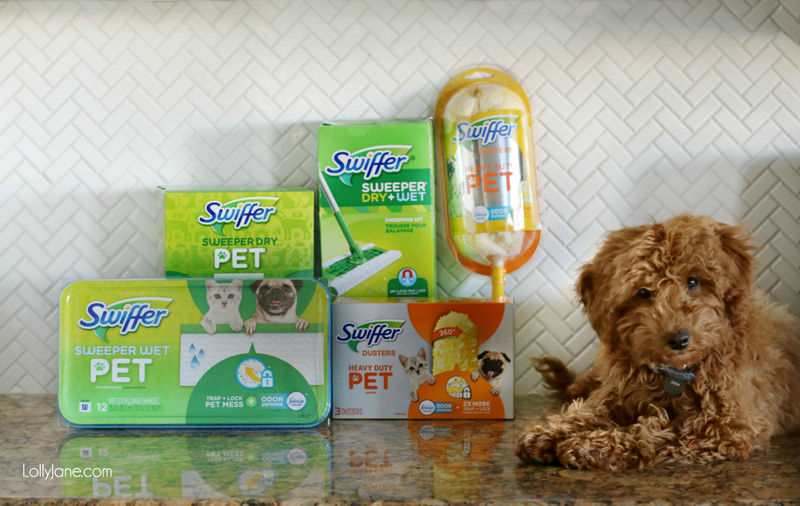 Whether you’re considering a new pet, just added a 4-legged friend to the family, or you’re a life-long pet lover, Swiffer can help with your pet-related clean up, no matter how big or small. I Got a Puppy, Now What? How Do I Clean Up Dog Hair? 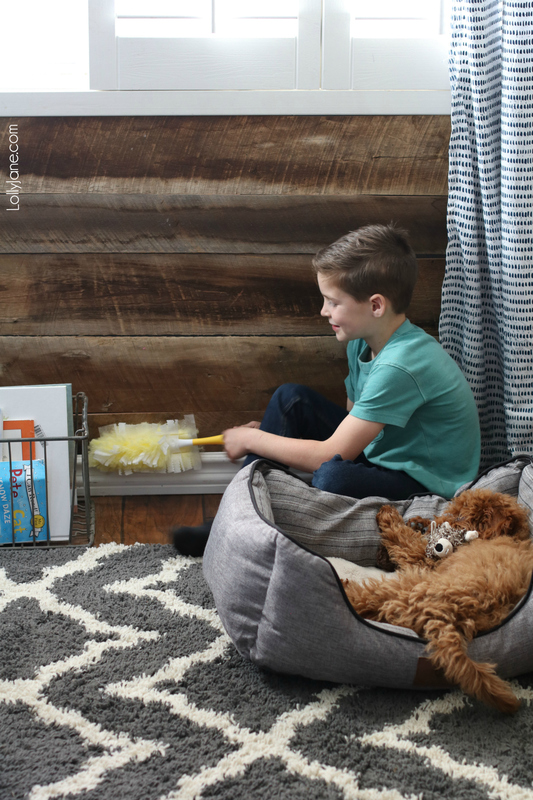 We sweep INSIDE the crate, OUTSIDE the crate and UNDER the crate to assure we remove all unwanted fibers and any unpleasant scents that are lingering… the Febreze Odor Defense really works its magic there! Once the area is swept, simply toss the Swiffer Sweeper sheet and replace with a Swiffer Sweeper Wet Pet sheet. Once you open the package, a delicious fragrance is released and you can hardly wait for it to touch your pet mess areas! Again, wrap around the Swiffer Sweeper head and mop areas around pet areas as usual. For tougher pet mess, the WetJet is an all-in-one system that cleans floors thoroughly usin cleaning solutions specially formulated to break up and dissolve tough messes; the wet streaks left behind immediately replace pet smells with a fresh scent! We live in the hottest state in the US and leaving our doodle outside year round isn’t a possibility but I’ve learned that prevention is key when keeping your house from smelling like a dog! Be quick to bust out your Swiffer cleaning supplies and don’t let messes sit. 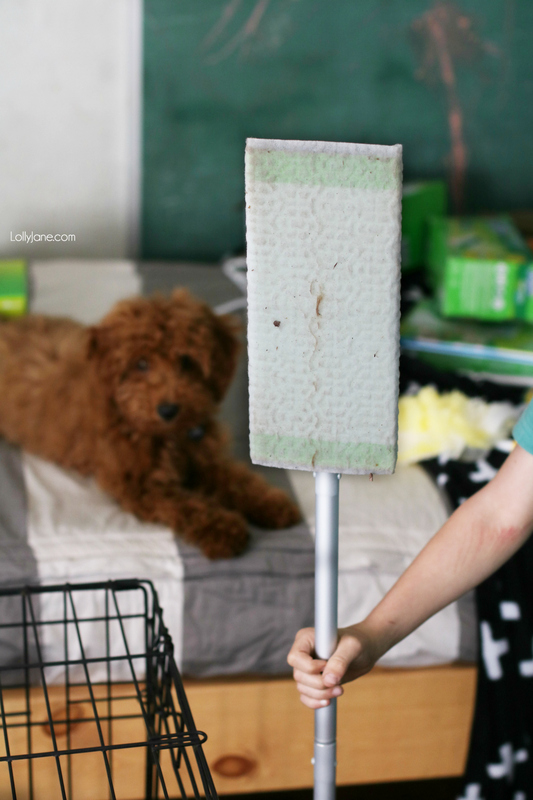 Another key point is keeping that pet hair out of sight; we love the Swiffer Dusters with Dust Lock Adhesive. 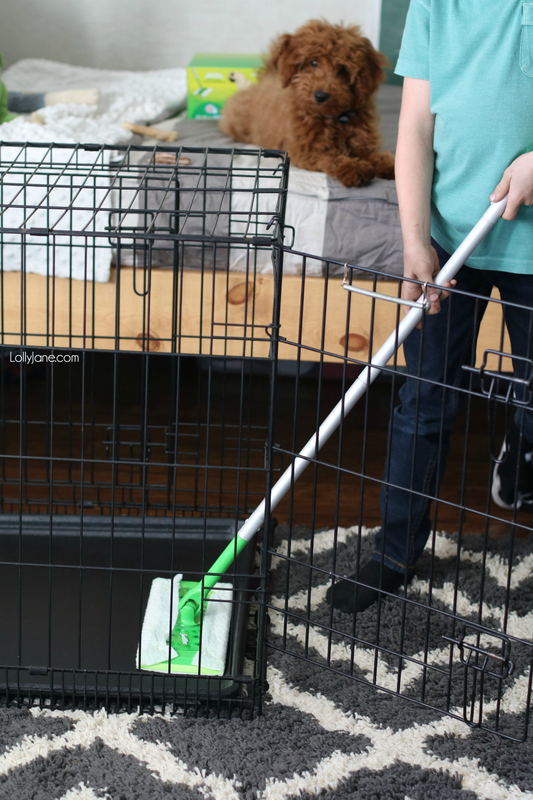 It cleans deep into grooves to trap and lock up to 3X more dust than a feather duster and works great in removing leftover pet debris from Newman’s crate. My son always shakes the particle-filled duster at his cute pup when dusting around him because he knows Newman loves to try to catch it. 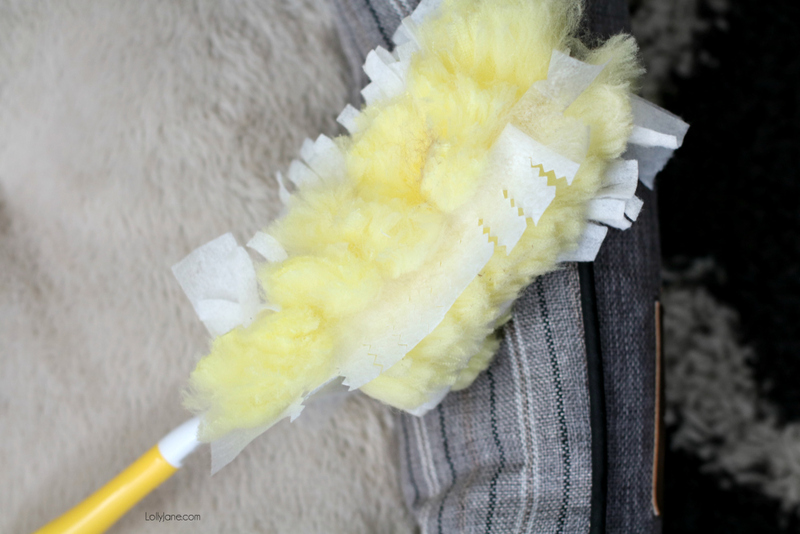 I’m always impressed that through all the shaking and twirling, the duster stays full of dust and everything that’s been gathered onto it! See? From pet hair to dirt, and who knows what else! 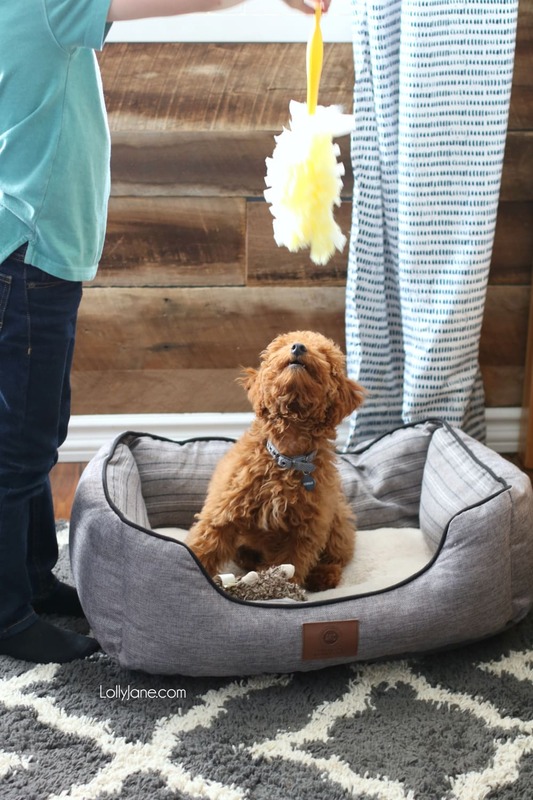 In addition to weekly baths (be sure to dry them thoroughly) and leaving a box of baking soda out to absorb smells, these products will help battle the indoor kennel smell your furry best friend may emulate. Where can consumers find more information about Swiffer products? More information on the entire Swiffer product line can be found at www.swiffer.com or www.facebook.com/swiffer. 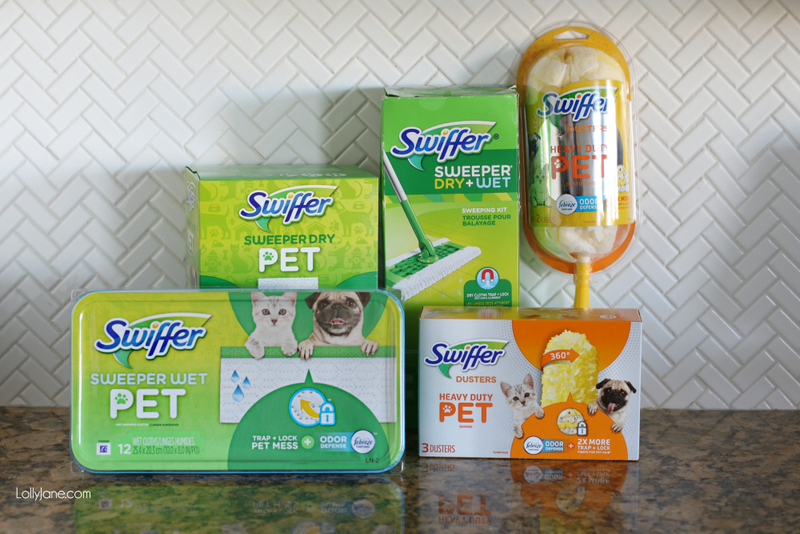 I had no idea the Swiffer made pet products!!! I’ll be looking into that on my shopping trip later today! Cleaning the crate can be a hassle at times, and a quick “swiff” sure would be easier than manhandling the tray out to give it a rinse in the shower! Can you give us some links to the non odor absorbing pet bed and the collar? Our dogs collars get so grody! And what Bath products do you like to use on Newman?